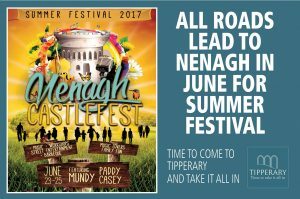 Our local market town on Nenagh celebrates the summer with the first ever Nenagh CastleFest this weekend. This mid-summer festival has its roots in traditional Irish music and jazz, but has expanded to include many other genres. The weekend kicks off with an opening night concert at Nenagh Arts Centre, followed by music sessions in a number of bars around the town. Saturday will see traditional music workshops in the morning, a family funday with live music, food and activities for all the family at The People’s Picnic in the Castle Field. Later on in the Castle Field, the highlight of the festival – internationally renowned artists Mundy, Paddy Casey and friends will take to the stage for a free open-air concert. What better way to round off a great night than to head to your favourite bar to listen to some of the best traditional musicians in the country?